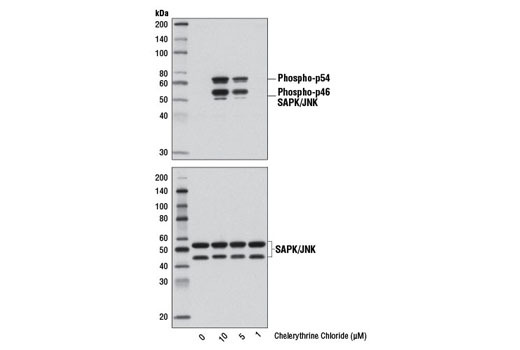 Western blot analysis of extracts from HeLa cells, serum-starved overnight and untreated or treated with Chelerythrine Chloride (2 hr) at the indicated concentrations, using Phospho-SAPK/JNK (Thr183/Tyr185) (81E11) Rabbit mAb #4668 (upper) or SAPK/JNK (56G8) Rabbit mAb #9258 (lower). Chemical structure of chelerythrine chloride. Chelerythrine Chloride is supplied as a lyophilized powder. For a 10 mM stock, reconstitute the 5 mg in 1.30 ml DMSO. Working concentrations and length of treatment can vary depending on the desired effect, but it is typically used at 1-20 µM either as a pretreatment for 15 min-1 hr prior to treating with a stimulator or used alone with varying treatment times lasting up to 24 hr. Store lyophilized or in solution at -20ºC, desiccated. Protect from light. In lyophilized form, the chemical is stable for 24 months. Once in solution, use within 3 months to prevent loss of potency. Aliquot to avoid multiple freeze/thaw cycles. 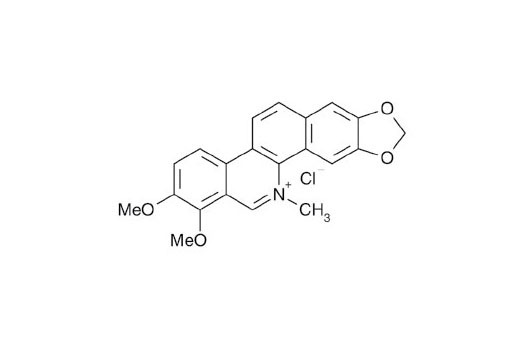 Chelerythrine is a benzophenanthridine alkaloid that elicits a wide range of biological responses. It was initially reported to be a potent PKC inhibitor (IC50 = 660 nM) through interaction with the catalytic domain, competitive with respect to the phosphate acceptor, noncompetitive with respect to ATP (1), and is often used in research as a means to inhibit PKC activation (2-4). However, subsequent studies have shown that chelerythrine is not a potent PKC inhibitor and its effects are independent of PKC inhibition (5,6). Researchers have demonstrated that chelerythrine activates JNK and p38 through an oxidative stress mechanism (6), inhibits Bcl-xL by preventing Bcl-xL-Bak BH3 peptide binding (IC50 = 1.5 μM) and disrupting the interaction between Bcl-xL and Bax (7), and induces apoptosis (6-8). Herbert, J.M. et al. (1990) Biochem Biophys Res Commun 172, 993-9. Chao, M.D. et al. (1998) Planta Med 64, 662-3. Nakai, M. et al. (1999) J Neurochem 72, 1179-86. Iwabu, A. et al. (2004) J. Biol. Chem. 279, 14551-14560. Lee, S.K. et al. (1998) J Biol Chem 273, 19829-33. Yu, R. et al. (2000) J Biol Chem 275, 9612-9. Chan, S.L. et al. (2003) J Biol Chem 278, 20453-6. Chmura, S.J. et al. (2000) Clin Cancer Res 6, 737-42.